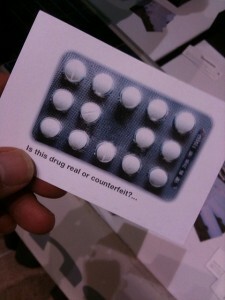 According to the World Health Organisation (WHO), counterfeit medicines are found everywhere  in the world. They include mixtures of toxic substances, and inactive, ineffective preparations; 700,000 people die annually  from fake malaria and tuberculosis drugs alone. The WHO also reports that the annual earnings from substandard or counterfeit drugs stand at about $200 billion USD . Many innovative solutions are being proposed to help tackle the spread of counterfeit drugs in developing countries. Ashifi Gogo  from Ghana is an entrepreneur with an innovative solution involving mobile phones. In simplified terms, the idea is to place a scratch-off label on the products; the label contains a unique code, which the consumer sends via SMS and then receives a reply as to whether the product is authentic or not. New packets of the drugs will have three-dimensional hologram seals and other features to indicate the drugs are authentic. Challenges in developing countries mean that investigators have to think creatively and come up with effective analytical techniques that cost pennies and are robust. “We found out that many of the fake artesunates, posing as a particular brand produced in China, contained calcium carbonate,” says Green [Michael Green from the U.S. Centers for Disease Control and Prevention]. Since the authentic brand did not contain calcium carbonate, he and his colleagues were able to distinguish counterfeits from the genuine tablets by adding vinegar to bits of the tablets. More important than their economic impact, counterfeit medicines pose a significant global public health problem. Not only do they endanger the lives and the well-being of patients, they also undermine confidence in healthcare systems and health professionals. 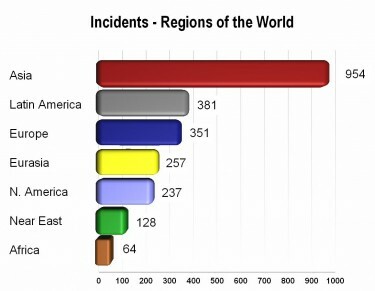 The following chart by the Pharmaceutical Security Institute (PSI) details the geographical distribution of confirmed counterfeiting incidents in 2011; the issue is increasingly challenging to tackle for the developing world because of the growing volume of fake drugs and the required infrastructure. Total counterfeit drug incidents by year. Graph by PSI (available in public domain). The regions that are more frequently linked to incidents are not necessarily those with weak enforcement and inspection programs. Rather, countries in these regions are effectively identifying pharmaceutical crime through law enforcement activity and inspections by drug regulatory agencies. Despite the innovation mentioned earlier, detecting counterfeit drugs is still a very difficult task and requires both advanced technology and the capacity to strictly enforce international regulations. For instance, many defective and counterfeit antimalarials were reported in developing countries  [fr] this year but only after patients had been treated. In 2012, a study showed that one-third of antimalarial medications  in Southeast Asia and Sub-Saharan Africa failed chemical analysis, packaging analysis, or were falsified. In 2007, the Ministry of Health in Kenya issued a warning  about counterfeit antimalarial medication Duo-Cotecxin being sold in Nairobi and how to detect it. Besides the presence of medicines not included in the World Health Organization malaria treatment guidelines, the ease with which medications were procured without accurate diagnosis poses another major risk to patients’ safety. In addition, this could have serious implications for the development of drug-resistant strains of Plasmodium parasites, particularly Falciparum, as novel treatments are not foreseeable in the near future. des personnes n'hésitent plus à revendre des produits pharmaceutiques sans ordonnance. Selon Fara, propriétaire d'un commerce prospère ” Les médicaments que nous vendons sont les mêmes qu'en pharmacie, puisque je les achète chez un grossiste agréé. Mais comme je n'ai pas autant de charges qu'une pharmacie, ils sont deux fois moins chers “. Le problème des consommateurs est donc le prix. Many convenience stores do not hesitate to re-sell medicines without prescription anymore. Fara, the owner of one such successful store, says: “The medicines that we sell are the same as the ones in pharmacies since I purchase them from a certified distributor. But my fiscal charges are much smaller than the pharmacies so I can sell drugs twice as cheap.” For consumers, the issue here seem to be the cost of the medicines. Kenya has been selected among nine other African countries that will benefit from a new multi-billion shillings drive in search for an anti-malaria vaccine. [..] “New malaria drugs and a vaccine are urgently needed in Africa, where malaria has grown resistant to the cheapest and most widely-used treatments. As several promising new drugs and vaccines move through the research pipeline, there is a need to build African capacity to conduct large-scale clinical trials of these drugs and vaccines over the next decade,” said Prof Binka [Indepth Network Executive Director]. were reported in developing countries: http://www.romandie.com/news/n/_Nombre_de_medicaments_defectueux_sont_vendus_dans_les_pays_pauvres_72110720120002.asp?